Earlier this week I wrote about Code Fred from the Museum of Science and Industry, Chicago. Code Fred is a fun game for learning about the human respiratory system. This afternoon I had a bit of fun playing Simple Machines which is another game from the Museum of Science and Industry, Chicago. Simple Machines is a game that is designed to help students learn about the basic physics principles involved in the use of levels, pulleys, planes, axles, and wheels. The object of the game is to help a robot character named Twitch gather the pieces needed to make a simple machine. In order to gather the pieces students have to help Twitch climb over objects using inclined planes, roll to objects as efficiently as possible, and lift objects by using pulleys and levers. Simple Machines could be a fun game to use as the introduction to an elementary school lesson about levers, pulleys, and basic physics principles. 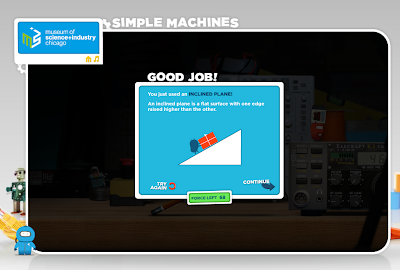 At the end of each section of the game students can read a short lesson about the planes, levers, pulleys, wheels, and axles.